Today I have a new company to inform you about.This new nail polish indie company is called 'Black Dahlia Lacquer,owned by Morey a former writer,and her daughter Aubrey,who is a college student currently studying nursing.Black Dahlia Lacquer is opening with a BANG October 3rd at Noon CST with 3 beautiful collections. Pre-sales will open today September 30th in both of their shops AND there is a 10% off discount during pre-sales only!!!! Excited yet? Well get excited, Black Dahlia Lacquer sells only 5-Free vegan nail polish. Today I have the pleasure of sharing with you 6 of the 12 shades from the Fall 2014 collection line. I in fact have the entire Fall collection which has 12 rich fall colors.The other 6 will be in a separate review,that way I don't flood you with tons of photos.I also have to comment on how beautiful her bottles are.They are a very unique shape which I have seen no other indie brand use.I LOVE these bottles!!! Also the nail polish bottles have nice matte caps with flat brushes.You can't EVER go wrong with flat brushes,that's just my opinion though. Let's check out these gorgeous lacquers below! This is described as a magenta jelly with small purple glitters,mediumn royal blue hexes,mosaic blue and violet glitter and iridescent glitters. I applied 2 light coats and a top coat.This polish applied very nicely with no issues.This is such a perfect crelly. The glitter and the base are a perfect combo. This is described as a brown-tinged grey shimmer with purple glass fleck. I applied 2 light coats and a top coat.This shade applied smoothly with no issues.I am a huge fan of grey polishes.It's one color that I can wear for a week straight without having the need to remove it.You can't see the purple flecks in my photos very well,but in the right lighting they pop.Another stunning combo! This is described as a oxblood red cream. I applied 2 light coats and a top coat.Blood Roses has a glossy finish and the consistency of the formula is perfection,not to thick or to thin.This is another color that's a must have.This shade will look fab with any skin tone.It's one of my favorite shades in this collection. I go crazy for fall colors!! I actually prefer fall colors over pastels and neons. This is described as a cornflower blue cream with blue and gold microflakies,(an alternative cream version of Beach Hydrangea). I applied 2 easy coats and a top coat.I mentioned above that this polish has blue and gold microflakies,I can't really see the blue microflakies but the gold pops out really well.Either way this is a beautiful shade for the fall season. This is described as a multi-dimensional full coverage gold glitter(alternatively one thin coat can be used as a glitter topper). I chose to apply Basket of Gold as a topper.I applied 1 coat of Basket of Gold over 2 coats of Blood Roses.I just happened to take every polish out of the box and when I looked down I saw both Basket of Gold and Blood Roses side by side and instantly I felt it was meant to be.They had to be paired together,it would just be oh so wrong not to. Don't they look perfect together? 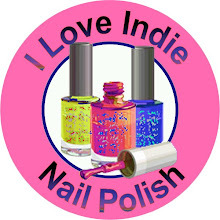 Coming Soon:I will be doing some nail art with Basket Of Gold soon.Till then keep your eyes peeled!! This is described as a light purple crelly with medium neon green hexes,light blue squares,larger aqua hexes,and smaller turquoise and periwinkle glitter. I applied 2 easy coats and a top coat.As with any crelly polish you will have a bumpy finish,have no fear add a coat or two of top coat.I also use Gelous to smooth all the bumpiness out then add a top coat.I really like this polish.My favorite thing about it is the neon green hexes.It makes the color that much more unique.It kind of reminds me of pollen on a flower that has been scattered around by a busy bee. What are your favorite shades in this half of the Fall 2014 collection? I really love Blood Roses,Basket of Gold and Japanese Painted Fern.I really can't wait to you see the rest of this collection,you will literally have to hide your pocket book.What makes this company even better is that every color will be available in a 8oz bottles or a 14ml bottles.I love how the smallest bottle is 8oz and it looks identical to the full size bottle. The 2014 Fall collection along with 2 other collections are now available for pre-order with 10% off of your order with a code.Be sure to follow Black Dahlia Lacquer on all of their social media and get that code!! October 3rd at Noon CST is when this line will formally launch.Links to both shops and media sites are posted below. Oh an Update from Black Dahlia Lacquer!! The 10% code is below!! Every month Cupcake Polish releases a box full of Limited Edition products contributed by indie companies and of course she contributes some of her handmade items in as well.Every month there is a new theme,October's theme is Think Pink to raise awareness for breast cancer.$250 will be donated no matter how many boxes sell.The Think Pink Sweet Addictions box will be release on Sunday,September 28th at 11pm CST.This box will be sold for only 30+shipping worldwide($3 shipping to US,$10 for shipping to Canada and Mexico,and $12 for shipping everywhere else).October's box contains products by Smitten Polish,Cupcake Polish and Bear Pawlish. Let's take a look at the limited edition items below. This is a neon pink glitter polish and is a reminiscent of a strawberry gumdrop. I applied 2 light coats and a top coat. This polish has a slight textured finish so I do recommend applying a top coat.This polish is super sparkly and one of my favorites in this box. I have never tried out the brand Smitten Polish before but I sure am loving it!! This is a neon pink holographic polish. I applied 3 light coats and a top coat. This is a beautiful shade of pink that reminds me of yummy pink bubble gum. This is a fuchsia linear holo PACKED with tiny matching colored holo glitters. I applied 1 light coat of Fight Like a Girl, and a coat of Gelous and then 2 coats of another fast drying top coat.When this polish is dried it is does have a textured finish. 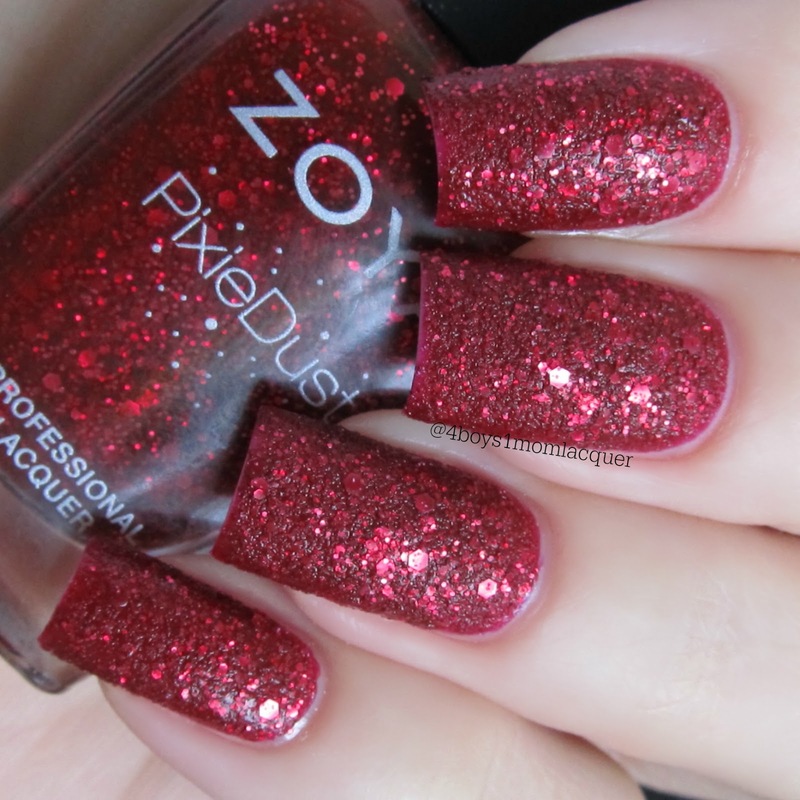 Even with a top coat you can still see bumps of glitter here and there.It is a beautiful color and polish! 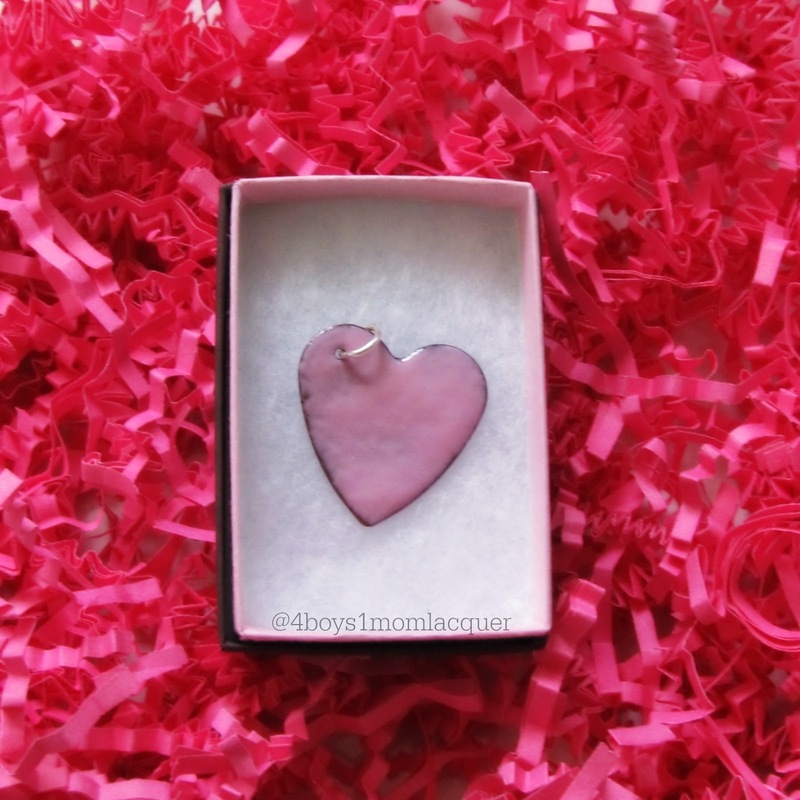 This is a pink metal heart shaped charm made by the mother of CupCake Polish. Isn't it lovely? 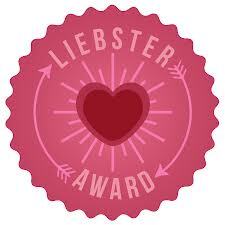 This will also be included in everyone's box. What do you think about October's Sweet Addictions box? If you love pink this box is perfect for you,not to mention this box is all about supporting a good cause,Breast Cancer. Set your calenders and alarms for Sunday,September 28th at 11 am CST to grab your Think Pink themed box.You don't want to miss out!! For more information on this box be sure to check out all of Cupcake Polish's social media sites. The links are posted for you below.This box will only be sold at Cupcake Polish. 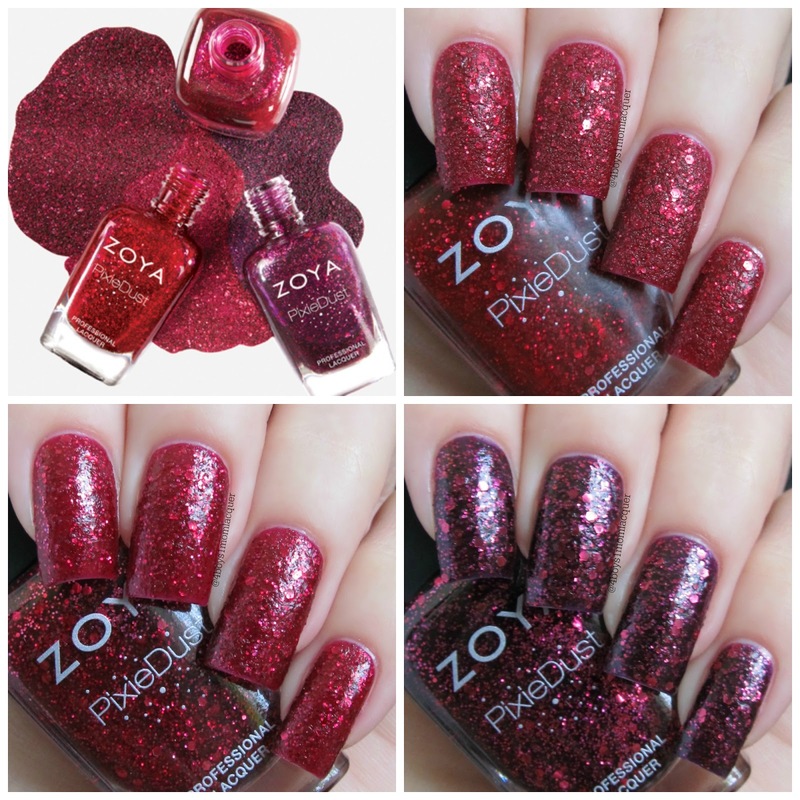 Today I have Zoya's new 2014 Fall Ultra Pixie Collection to share with you. 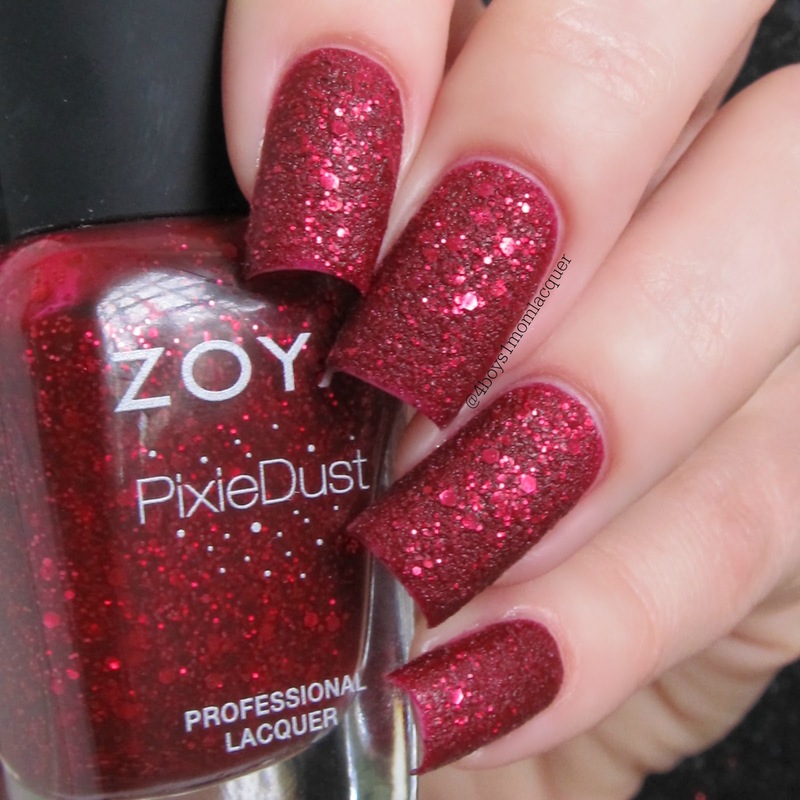 I was so excited to see Zoya released darker red Ultra Pixies.I know that these Ultra Pixie's are not for everyone and they can at times look and feel weird on your nails but it really doesn't phase me a bit.The textured feeling used to bother me to where I would be constantly touching my nails but now I'm used to it.There is 3 new red shades in this collection.You have the option of purchasing them separately for only $10 a piece or there is the sample pack that comes with all 3 polishes for only $30 with shipping and handling of course. Lets take a look at the new Ultra Pixie's below. 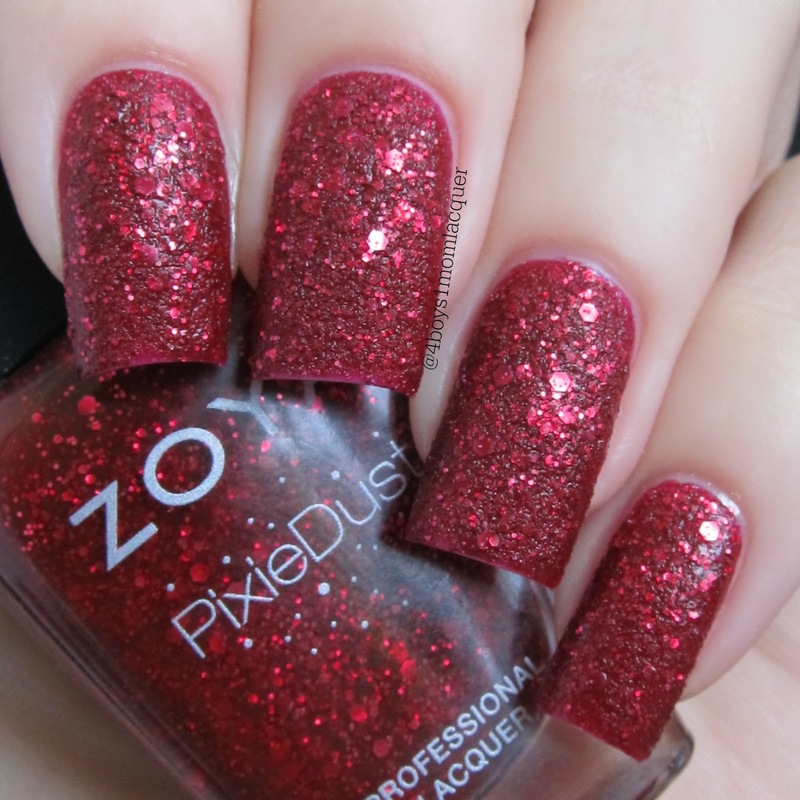 This is a true red textured PixieDust with crimson Mega Hex particles. I applied 2 light coats,no top coat.I have to say,this one is my absolute favorite shade and finish out of the three.This has a nice matte finish that I find very appealing.It applied perfectly,no issues at all. This is a blue-toned red wine textured PixieDust with Mega Hex particles. I applied 2 easy coats,no top coat. Arianna is not as textured as Oswin and I noticed it has a different finish.This shade has a glossy finish which I'm not a fan of.I prefer the matte finish for all of the Ultra Pixie's.It's a beautiful color and all,if it had a matte finish it would be perfect.The color is a bit similar to Oswin just a tad darker. 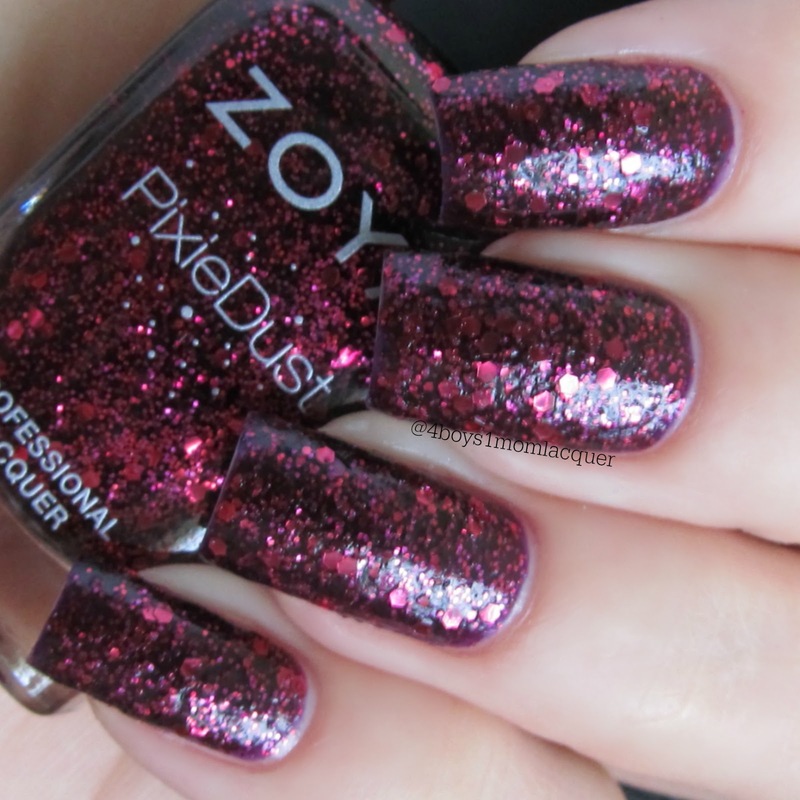 This is a deep, vampy plum textured PixieDust with red Mega Hex particles. I applied 2 light coats,no top coat. Noir has the same exact finish as Arianna.I'm not a fan of that as I mentioned above but the color of this beauty makes it worth it. I am a sucker for dark and vampy shades. The 2014 Fall Ultra Pixie Collection is available for purchase for only $10 a piece or there is the sample pack that comes with all 3 polishes for only $30. What are your thought on these new shades?Which ones do you love?For more information on this collection be sure to check out all of Zoya's social media sites.The links are posted for you below. As you know Halloween is creeping up on us really quickly.Who does not love Halloween?It's possibly your favorite holiday!It's filled will scary costumes and candy and cute little kids running around everywhere on a SUGAR HIGH!Hmmmm...I've seem to have forgotten to mention one more thing.Oh I know,NAIL POLISH!!! !Not just any nail polish, spooky Halloween nail polish. If you have been waiting all year to get your hands on some Halloween themed nail polish,you are in luck! Today I have a collection of 6 nail lacquers made by Dollish Polish to share with you.This collection is called "Zombies Need Love Too....And Brains".If you are obsessed with hungry,flesh ripping zombies,nail polish or Dollish Polish then you are in the right place and this collection is perfect for you.This collection is set to launch Saturday,September 27th and will be available through Halloween.Are you excited yet?Okay....lets take a look at these amazing shades below. This is a antiqued blacked bronze polish with bronze and brass flakes and glitters. I applied 2 light coats and a top coat.As soon as I read the name of this polish I started to giggle.I immediately thought of my sister. I so need to send her a bottle of this beauty. HAHA!!! This polish applied perfectly with no issues.I think you can get away with applying 1 coat.When I applied the first application it was opaque and I was not going to apply a second coat but my OCD took over and I just had to. This is a smokey chocolate brown multi-chrome polish that has a green,turquoise and violet shifts. This is a brilliant midnight blue with a purple flash,loaded with ultra fine micro glitters in shades of silver,periwinkle and blues. I applied 2 light coats followed by a top coat.When I saw this color on my nails I was like, "*GASP*! Damn this color is breathtaking!!". This shade is hands down my favorite in this collection.I just can't help but get butterflies when I look at it. This is a rich and creamy dark plum raisin colored polish. I applied 2 light coats followed by a top coat.This polish does have a satin finish so a top coat is needed for the glossy finish.The name of this shade is perfect.This is the color I see after a zombie has ripped helpless people to shreds.Blood everywhere!Dried up and old blood dripping and scattered everywhere!!!! This is a fun Autumn clear base glitter topper packed with grey,brown,dark green,plum,purple and burgundy glitters. I applied 1 coat of 'Zombies only Like You For Your Brain' over 2 coats of NOM!NOM!NOM! followed but an application of top coat. This is a full coverage glitter polish packed with shades of moss,hunter green,silvers and a spatter of red. I applied 2 light coats and a top coat.This polish applied evenly with no clumps or bumps.No undies! If this collection doesn't scream Halloween I don't know what does.Zombies Need Love Too..And Brains is such a fun collection and the names of the polishes are genius.Are you dying to get your hands on these shades? They will be available for purchase Saturday,September 27th over at Dollish Polish's site.Be sure to check out all of Dollish Polish's social media sites for more information on this collection.The links are posted for you below.